Thank You! An email confirmation is on the way! 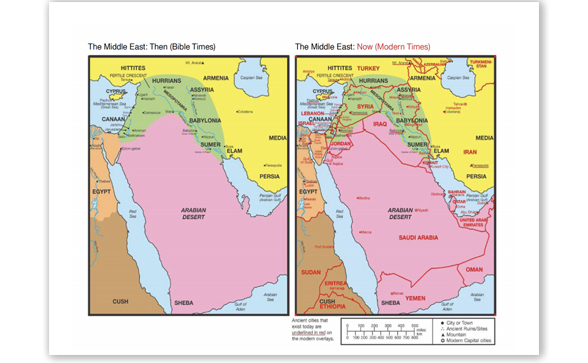 Then and Now Bible Maps: Middle East has two fascinating side-by-side maps that compares the Middle East in Bible times and the Middle East today. The Bible Times map shows important places in the Bible such as Babylonia, Assyria, Nineveh, and Jericho. The Modern Times map overlays the Bible Times map with the current borders of countries in the Middle East, such as Israel, Syria, Iraq, Jordan and others. The Modern Times map also includes other important Middle East locations such as Mecca, Baghdad, Tehran and other locations. Then and Now Bible Maps: Middle East will help you envision important Bible Time locations in comparison to modern day events.